Holocaust art recovery stories cry out for justice. But what was the result when the dark stain of Nazi-looted art was laundered clean through the official acts of a valued WW II ally? Federal Judge John F. Walter addressed this question when, on August 9, 2016, he dismissed an attempt by the current heir of Jacques Goudstikker to reclaim two 16thcentury paintings by Lucas Cranach, the Elder (“Adam” and “Eve”) from the Norton Simon Museum of Art at Pasadena. Our story starts in typical fashion for Holocaust art recovery cases. Jacques Goudstikker was a Dutch Jewish citizen and one of the wealthiest art dealers in Europe. When Nazi Germany invaded the Netherlands in 1940, Mr. Goudstikker fled and left behind his Dutch and Flemish Masters collection, including “Adam” and “Eve.” The two pieces found their way into Herman Goring’s private collection after a forced “sale” of most of the Goudstikker art collection. As if this story were not tragic enough, during his flight from the Nazis, Mr. Goudstikker accidentally fell into the hold of the SS Bodegraven in the English Channel, fatally breaking his neck. His rights passed to his wife, Desi, and his son, Edo. In 1996, both Desi and Edo died. So, Edo’s surviving wife, Marei von Saher, is now the only heir-claimant to the Nazi-looted art assets. With Germany’s defeat, the United States Army (yes, the Monument Men!) 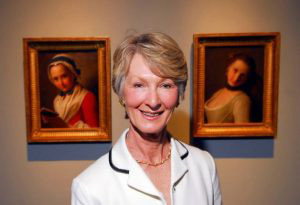 recovered much of the Goudstikker collection, including “Adam” and “Eve.” However, it was United States policy to return Nazi-looted art to the country of origin, and not to the individual pre-war owners. The United States felt that the countries of origin were in the best position to adopt fair rules to repatriate Nazi-stolen items to their own citizens. Judge Walter’s opinion describes at length the applicable statutes enacted by the Dutch government to process the return of Nazi-looted art. If art was taken from a claimant in bulk with other items then the Dutch government would only entertain a return of all items. Cherry picking of items to be reclaimed was not permitted. But back in 1951, the Goudstikkers could not make the payment necessary to redeem the collection stolen by Goring. They had to allow the claim deadline to pass. In 1952, the Goudstikkers made a separate settlement with Dutch authorities for other assets stolen by a different Nazi official, but the Goring-looted “Adam” and “Eve” remained beyond their financial reach. Once the Goudstikkers “waived” their restitution claim, the Dutch government transferred “Adam” and “Eve” to its national art collection. In 1966, “Adam” and “Eve” were sold by private sale to George Stroganoff-Scherbatoff. In 1971, Mr. Stroganoff-Scherbatoff sold the pieces to Norton Simon. This last purchaser, Norton Simon, was a world class art collector who, in 1974, selected the Pasadena Museum of Modern Art as a permanent home for his holdings. Ultimately, Mr. Simon assumed the Museum’s leadership until his death in 1993. To this day “Adam” and “Eve” remain part of the Museum’s permanent collection (the Museum having been renamed the Norton Simon Museum of Art at Pasadena) and the pieces have been on public display for many years. In 2007, Ms. von Saher sued the Museum in California to recover “Adam” and “Eve,” challenging the Dutch post-war repatriation process. On the plaintiff side is a claimant who presents a compelling and largely uncontested story of Holocaust seizure, loss and Dutch governmental over-reach. Jerry Brown, when Attorney General of California, supported Ms. von Saher with “Friend of the Court” briefs. On the defendant side is the well-regarded Norton Simon Museum whose benefactor purchased two famous works of art having a sterling provenance, that is, only one step removed from Dutch government ownership. Strong ties have developed between the pieces and the surrounding California community. The Court awarded this round, and “Adam” and “Eve,” to the Norton Simon Museum. The Court decided that the Goudstikkers voluntarily elected not to comply with the Dutch government’s repatriation rules. As a result, title to the works passed to the Dutch government. In other words, a sovereign state is free to set its own rules. Countries do not have the authority to countermand the internal laws of another state. We’ve previously posted about the Act of State Doctrine when US Courts refused to reverse the 1918 USSR seizure of a Van Gogh and a Cézanne from an ancestor of Pierre Konowaloff (see: Stolen Art Becomes Stalin’s Art). The dismissal of that case, and the Soviet seizure, has been sustained on appeal since the date of our post. Marei von Saher has promised an appeal of Judge Walter’s decision. That’s to be expected because this case has already been twice dismissed by Judge Walter only to be reinstated each time on appeal. However, with the adverse track record established against Act of State Doctrine claimants by the Konowaloff case, challenges remain for Ms. von Saher. Case Update: On July 30, 2018, the Ninth Circuit affirmed the District Court’s dismissal of Ms. von Saher’s claim. Absent any grant of reconsideration or appeal to the US Supreme Court, this decision effectively ends Ms. von Saher’s 10-year legal quest to recover these artworks.